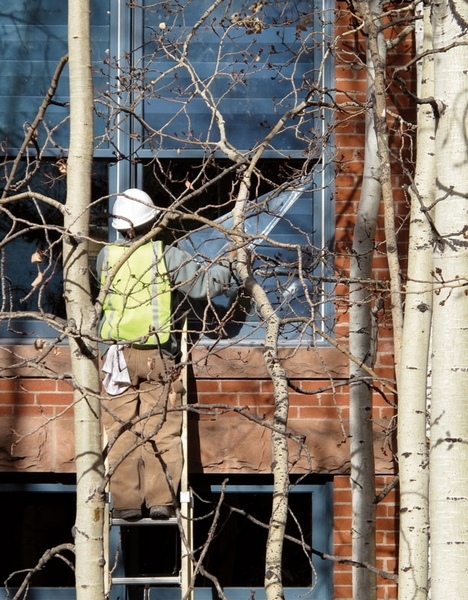 Andre Salvail/The Aspen TimesA construction worker peels the plastic covering off of the new energy-efficient windows at the Hotel Jerome on Monday. The hotel will hold its "soft" re-opening on Dec. 14, including the J-Bar. ASPEN – The massive Hotel Jerome renovations are progressing on schedule, and the 123-year-old lodging property will reopen as planned in mid-December, general manager Tony DiLucia said. Dec. 14 is the target date for a “soft opening,” he said, and the J-Bar will be doing business, as well. The formal opening for the hotel and its many operations will be Dec. 15, he said. Rumors abound in the community about how the Jerome is going for a contemporary look and that it won’t open until January. DiLucia dispelled both notions. The refurbishment, the hotel’s first since 1985, is designed to emphasize the Jerome’s historic character with a nod toward early 20th century styles. To the dismay of J-Bar regulars, the hotel closed at the beginning of August to accommodate the project. The number of construction workers on some days has surpassed 200, DiLucia said. Many of them are transported into Aspen each morning from the Brush Creek intercept lot. The city’s Parking Department director, Tim Ware, estimates that the project workers have only taken an average of six to eight parking spaces daily in the Bleeker Street area on the north side of the hotel. Many workers are carpooling, he said. Some already live in the area. After Dec. 1, the parking and noise patterns in the area should return to normal, DiLucia said. That’s when the renovations move into full “punch list” mode. • A new look for all 94 rooms that combines the hotel’s historic feel with new wallpaper, curtains, carpet and molding. • Improved technology in each room with desks that offer computer connections to flat-screen TVs and the ability to recharge iPhones and iPads. • A new heating and air-conditioning system that will allow guests to heat or cool their rooms irrespective of the time of year. The former system heated the building only during certain months and cooled it during the remaining months. • An expansion of the Wheeler Room for private dining and banquet-style events. • Transformation of the Century Room, a dining area, to its historic use as a living room with a bar. • New lobby furniture that runs a gamut of styles from the 1920s to the 1950s. • A spa, with three rooms, at the lowest level of the building. • A freshening of the J-Bar and the Library area. DiLucia said more than 800 people applied to work at the hotel for the winter season. During the renovations, no major problems occurred, DiLucia said. Haselden Construction was the general contractor. Rowland and Broughton, of Aspen, served as the project architect. Todd Avery Lenahan, of Washington, D.C., and Henderson, Nev., handled interior-design concepts.